Last week, I got an email from Bill about helping with some reviews of Biovex baits for Bass East and a new project of theirs. I was more than happy to help - excited in fact. Bill is going to be doing the bulk of the reviews for the new project, so we kicked around different formats, pictures, videos, etc. that would make them stand out. We knew we wanted to do underwater footage, so a clear body of water was a must. 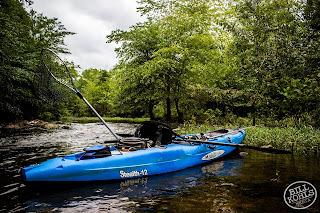 If you have read any of my other blogs this spring, you know how rainy it has been here in central North Carolina - resulting in high, muddy water. I knew that finding something clear would be a chore. I made a few calls and found that none of the local lakes were going to work. But I kept my eye on the river gauges and after 5 days of no rain, a few were starting to look pretty good. So on Friday evening I drove by a few spots, searching for the clearest. The decision making was difficult. A couple areas looked perfect for fishing, but not for filming. Others looked perfect for filming, but did not look like great places to wet a line. Then I remembered a stretch of water I have wanted to fish for over a year now. It is a very small river with a couple tributary creeks that only run during high water. The rumor was that it was almost always clear and was a decent fishery. The problem with rumors is that you never know what you are going to get. This rumor turned out to be more than true. I met a guy two summers ago who had first told me about the stretch. I had fished the lower part of the river before, but never up as far as he had talked about. He said that access was tough and parts of it were a chore to get through, but that fishing was often good. Unfortunatley, I couldn't remember his real name or his NCangler screen name. So, I made a call to the one person I knew might remember. And as he typically does, he came through. In fact, he not only remembered his name, but he passed along his contact info. Thankfully, the contact remembered meeting me, so I sent him a message asking about water clarity and access. He said it was fairly clear and got us an access point. Although intrigued, I was still hesitant. So, I pulled up a map and called Bill. He brought up a map on his computer as well and we went over 3 or 4 different stretches of different rivers, trying to decide where to go. I had fished most of the stretches before, but for some reason, the intrigue of the unknown kept drawing us back to the new spot. We decided we would go there first and if it wasn't clear enough, we would turn around and go to option 2. 8 AM rolled around and Bill showed up right on time. I had loaded the yaks the night before, so we hit the road in anticipation. We got to the launch around 9 AM and immediatley headed for the water. It was clear. Not gin clear, but clear enough to get the footage we needed. We unloaded and bushwhacked our way to the river - carrying the yaks through high grass and around downed trees before maneuvering down large boulders to the rivers edge. We were cut up, tired, and covered in mud - and it was only 9:30. But our adrenaline was pumping. The excitement that a new, unknown river holds is unmatched. We fished through a few pools that looked awesome - flipping and throwing topwater around trees, bushes, and boulders. But we went close to 30 minutes without a bite. We came to a small shoal and I had a 13" bass blow-up a Rico Popper in the push water. Then Bill landed a bass on the Biovex Face 70 topwater bait. But the action was inconsistent. We had a couple small blow-ups and landed a few sunfish before I finally landed another largemouth - this one on a plastic worm. Then we came to a long pool. That pool changed everything. Immediately Bill caught two bass on the Face 70, including a solid 3.5 lb fish. That prompted us to stop and shoot some footage of the underwater fish releases as well as some bait footage. I helped him get shots of each bait and we took video of how they looked from above the water. 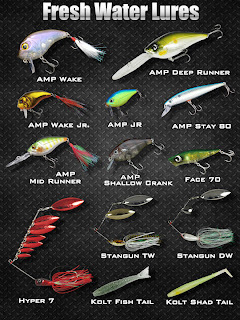 While Bill was snapping shots of the Stangun DW, I picked up the Amp Mid Runner crankbait and took a few casts. On the second cast, the bait got crushed after deflecting off an underwater rock ledge. I landed the chunky, 15" bass and we got some photos of the bait, wedged completely in its mouth. Then we did some underwater footage. We started with the Amp MR. After a bunch of takes, I made a longer cast than I had been - this time toward a nearby log. As the bait came over the log a bass inhaled it and took off straight toward the camera. Bill - shirtless and snorkeling with the GoPro 3 - had no idea that I had a fish on the hook as it trucked toward him. I envisioned a treble hook pierced through Bill's chest, but thankfully, the fish just missed him. We got some really cool footage and kept filming. Two casts later, I hooked up again. This time, I made sure to yell loud enough that Bill heard me. This fish was smaller and easier to handle, but he still fought hard and ran directly into the camera at one point. After getting all of the footage we needed of all the baits, we started focusing on fishing again. 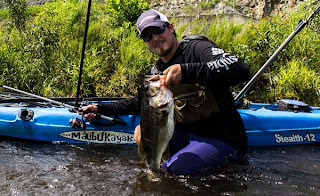 We worked the long pool - landing another dozen bass on a mix of baits. Then we came to the next run, which had some mixed grass, boulders, and eddy seams. 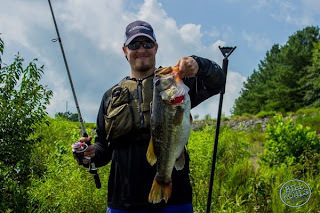 There we landed another 5 or 6 bass on topwaters and crankbaits including a few topwater blow-ups that we got on film. This river - smaller than many creeks - was turning out to be awesome! We pressed on and explored some side channels. One tributary creek was dry. Another was too low to have anything but small fish in it. Then we spotted a channel that looked like it had potential. The water flowing from it was signficantly colder than the main river temperature and we could hear whitewater of some sort. We trudged through mucky silt, grass, a downed tree, and smelly algae before coming to a spill pool. It looked like one of those spots that could hold a big fish. But our efforts were all for not....well, all for a bream. So we trudged back down the channel and back to the main river. It was nearly 1 PM by then and a cloudy morning gave way to full sun and high temps. The river channel significantly narrowed - looking much like a trout stream in most sections. But we continued to find holes, chutes, and eddies that held fish. By the time we left the river - around 5 PM, we had caught upwards of 50 fish - 5 bream, two crappies (on topwater), 5 catfish, and 35-40 largemouths. Most of the bass were in the 12"-14" range, but man did those fish fight like freight trains. And of course, we caught some nice ones too. The highlight of my day came toward the end of the trip. After working a hole with a crankbait and topwater, I switched to a stick worm. I threw the worm toward a current seam and let it sink. As I picked it up off of the bottom, I felt it catch on a few small pieces of grass. I ripped the bait free and let it fall again. As I picked up on it, I felt a fish and set the hook. Immediately line started peeling of my reel. 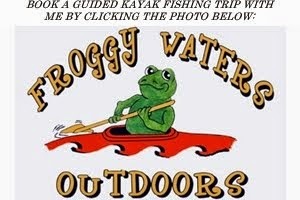 I cranked down the drag and the fish began pulling my kayak all over the place - a fantastic kayak sleigh ride. Then she went aerial and Bill and I both shook our heads in disbelief. She pulled and pulled before I finally got her in the net. My favorite rod - the Carolina Custom Rods Finesse Special - had struck again. At 22.5" and 6 lbs 10 oz, she was a giant - gorged on river minnows and bream. I bet she would have pushed 8 lbs earlier this spring. Even with my affinity for catching big fish in small rivers and creeks, I could barely believe a fish of that size lived in that flow. We snapped some photos and sent her on her way. Thanks to the big girl, our best 5 bass for the day would have went around 21 lbs. Bill also landed a beast of a creek catfish on a jig - well over 10 lbs. 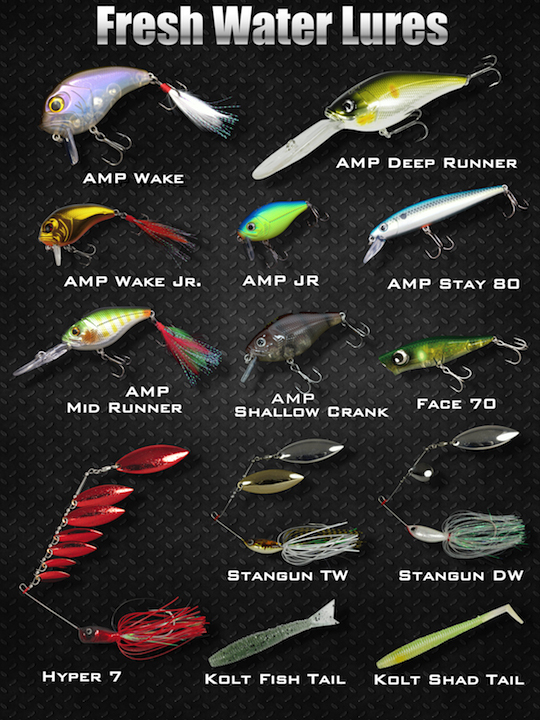 The crazy thing is that we caught fish on just about everything in the box - topwaters, jigs, spinnerbaits, buzzbaits, crankbaits, plastics, and swimbaits. All of the Biovex baits we tried were not only productive, but impressive - and I was skeptical at the start. Their new jig (not yet on the website) has some flashabou tied into it as a long, trailer type tail. We were both extra-skeptical about it, but it definitely outproduced all of the other jigs we threw. As well as the baits mentioned above, I also got to throw their new swimbait. It looks sick in the water and I landed mutliple bass on it while burning it down foamy, current seams. A big thanks to everyone who helped us research this spot. As usual, it was a blast fishing with Bill and shooting photos & video for his company - Bill Kohls Media. Until next time, tight lines! fishing in sydney At Foreshore Fishing Tours, we have been offering some really amazing Sydney fishing experiences to our patrons since a decade. When searching for a bass fishing reel, the first thing to do is to make sure that reel feels like it isn't the right size. If a reel feels large and bulky in your hand then it is too big. Wow that really big. It is a great adventure for me. 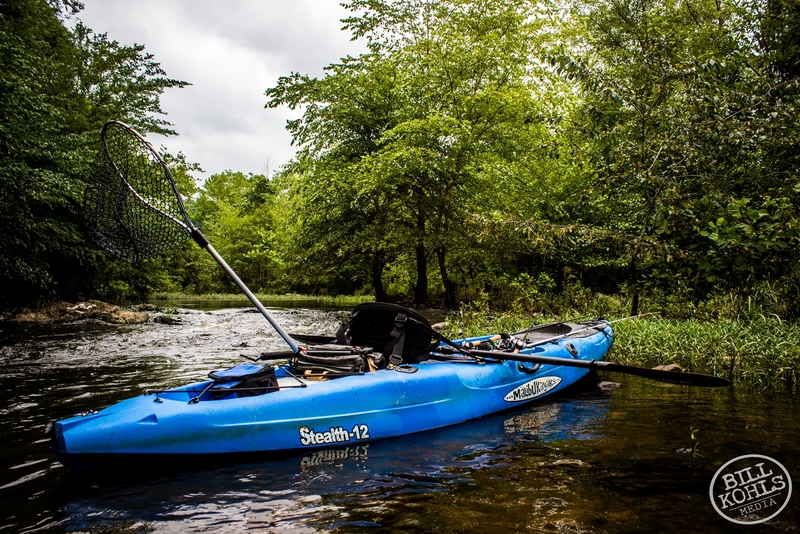 I always love to fishing and kayaking. The blog is like a chocolate for me. I want to have it all the time.